There are over 30 menopause symptoms women who are about to end their fertile years may experience. While conventional doctors are often quick to recommend hormone replacement therapy (HRT), women may be more inclined to pursue natural ways to treat menopause symptoms. Continue reading to find out some natural ways to relieve menopause symptoms so that you can go back to living a symptom-free lifestyle. Oftentimes, the best natural menopause relief comes from changing lifestyle habits. This involves optimizing one's diet with a wide variety of fresh fruits and vegetables and whole grains to ensure that there are no nutritional deficiencies; regular exercise of 30 minutes a day, 5 times a week; and avoiding destructive habits, such as tobacco use and excessive alcohol and caffeine consumptions. However, although these measures will promote endocrine system health, the problem arises when symptoms are extreme, requiring more direct methods for symptom alleviation. Natural treatments for menopause are gaining more popularity because they can be more effective for intense symptoms than simple lifestyle changes, yet have less severe side effects than traditional treatments, such as HRT. 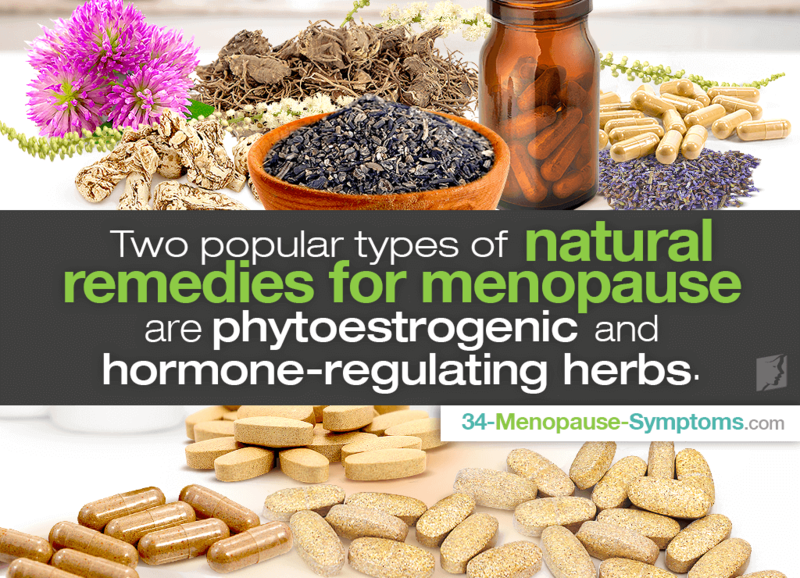 Two most popular natural remedies for menopause are phytoestrogenic herbal supplements and hormone-regulating supplements. Each serves a specific function within the female body. Phytoestrogenic herbal supplements - such as black cohosh, red clover, St. John's wort - act by introducing potent plant estrogens into the body in order to replenish the majority of the estrogens that have been lost when ovarian production halted, mimicking the effects of the hormone. As such, they can help relieve symptoms related to an estrogen deficiency. However, over time, the body may become less capable of producing estrogen on its own, further decreasing the body's own hormone levels. On the other hand, hormone-regulating supplements, like Macafem, support the natural production of hormones. Unlike phytoestrogenic supplements, which introduce outside hormones into the body, hormone-regulating supplements nourish the endocrine glands to produce natural hormones more efficiently. Accordingly, they are a safer way to treat menopause symptoms. Other alternative methods for menopause symptom relief include homeopathy, aromatherapy, talk therapy, acupuncture, and biofeedback. Their use will be dependent upon symptoms experienced and their severity as some methods work better than others. Click on the following link to read and learn more about the different options for the treatment of menopause symptoms. Leading a healthy lifestyle is imperative to relieving menopausal symptoms. Click here to read how to improve your overall health. As women approach menopause they may want to know what will happen to their hormone levels and how to treat the symptoms hormone changes cause.